This webpage is a near live research expose on the phenomena titled above. Thoughts are projected without peer review, these thoughts will be altered given input from others or new data, correction notices will be placed afterwards, all texts will either be perfect or will have corrective paragraphs. The errors are left out on purpose, showing that the observer/writer is discovering a new vision of the world which was always there, inviting all to view and appreciate. EH2r is not a new phenomenon, it has been seen by most humans since the dawn of time. It is an optical effect caused by atmospheric refraction, which is usually classified in two components, astronomical and terrestrial. In our Polar case, it may be a combination of both, but it is more an effect of astronomical refraction. Novaya Zemlya Island Russia, is the name used for the first historical account describing what I call the line. What was particular about this observation is that it was thought to be an anomaly, it is in fact quite common, given that the High Arctic horizon is clear from any obstructions, it is a daily occurrence during early spring and late fall. Although, to my knowledge, a handful of people and scientists fully understand that EH2r is especially huge in the Polar regions, this ignorance is not helpful. All Navigation Almanacs, GPS instruments do not have warnings instituted in their tables, none can calculate EH2r exactly, some cant predict a sunset or sunrise accurately within 40 minutes! Given that the disparity in EH2r is intrinsically linked with the temperature gradient, and very colder temperatures give a much greater refraction boost, it is more than possible to literally see the effects caused by Global Warming. The warming of our Global atmosphere will unquestionably cause a disappearance of the Polar daily sunrise/sunset geometric stages which we have somewhat ignored. Refraction is a physical phenomenon of light bending through different mediums. Place a pencil in a transparent glass of water, and see the immersed pencil light bend. The same process occurs from space to your eyes, space light bends through our atmosphere, any light source from space is bent to a certain extent, much more if the light is very near the horizon. 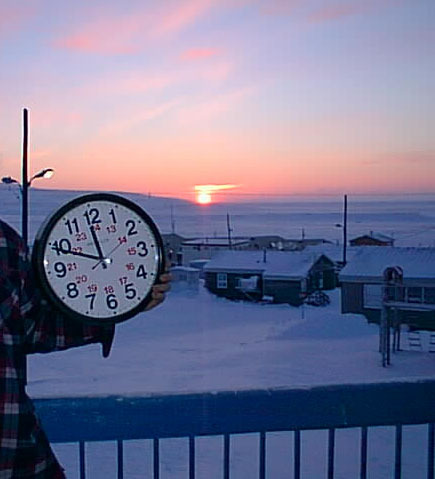 February 9 2001, official sunrise time would have been 11:40 local time. As you can see at 11:47 local the sun was well above the horizon. The 7 minute difference barely covers the bluff below the sun. In fact the top part of the sun should be about .2 degrees above the horizon at the time of the picture, the sun being .533 degrees in diameter, it is obviously well above that point. So far in February 2001, no computer calculation of sunrise or sunset was proven right, sunrise occurs way earlier and sunset later than with software calculations. This means that computer program calculations are wrong when it comes to low on the horizon Polar refraction. Nov 7 2000 at 1840 UTC, more than one full day after official sunset (calculated with refraction), the sun was seen despite a few clouds. Estimated sunset for that day is about 1900 UTC. With a total refraction boost of about 1.7 degrees roughly twice than usually calculated with present refraction models, it is safe to say that polar refraction is not clearly understood. A benefit from a colder climate is simply more light. High Arctic light is essential for all living things. With irony, hostile glacial cold weather gives more light, life. Global warming may offer warmer Arctic weather in exchange for darker skies. There is a need to ponder and see if we can verify this with old satellite pictures, if the earth is getting warmer, perhaps the Polar regions are getting darker. 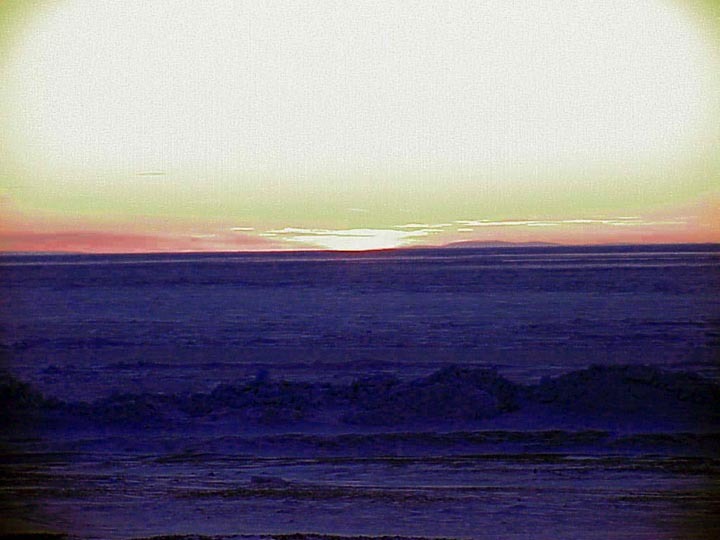 For all polar animals, shorter daily twilight hours may be harder to take than a modest temperature increase. Above picture: February 1, 2001 picture of sun Upper limb 18:19 UTC.  The sun is seen next to the left of the lower hill near the center.Sun was visually seen, but digital camera didn't differentiate the very weak sun with local background colours. Upper limb of sun quite oblong. Sun Elevation was approximately -1.7 degrees, in quite warm -28 degrees Celsius weather. Seasonal temperatures should be around -29 to -37, in fact Resolute Bay usually experienced extremely cold -40 C weather at this time of the year. Despite warm weather the sun appeared 3 days before it should, official sunrise was calculated to occur February 4 at 17:52 UTC. The original digital picture was taken on Feb 01 with a digital camera unable to duplicate human vision. The upper limb of the sun was seen nevertheless. While somewhat adjusting colour levels of the original shot, the sun position can be clearly seen in the digital picture above. 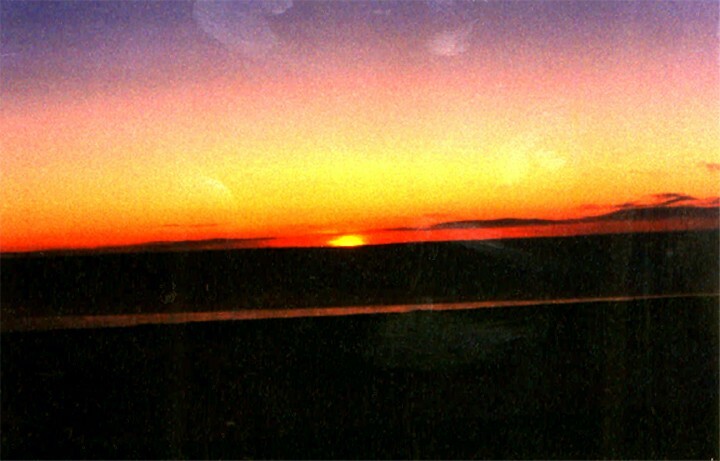 The horizon has a reflection projecting the upper limb of the sun, no other portion of the horizon shows this feature. The picture not adjusted for colour shows the flaws of the digital camera, the ice was not blue, my eyes neatly distinguished colour differences between the sun and clouds. however the presence of the sun can be made out by the orange pixels found right under its position. 35 mm camera pictures of this same event will be displayed if they pan out satisfactorily. The difference between the November 7 sunset and February 1 2001 sunrise is striking. The same refraction boost was noticed, approximately 1.7 degrees from the sun center. This essentially infers that the atmosphere was remarkably similar, in fact it was not, the stratosphere of November 7 was much colder than February 1, on the other hand the troposphere of February 1 was slightly colder than November 7. I expected February 1 refraction to be much greater, given that February is usually a very cold month for Resolutes atmosphere. This was not the case. Horizontal refraction seems to be dependent on the entire atmospheric profile. Contradicting the modern practice of using surface temperatures as a refraction correction factor.